I mentioned last week that I might be addicted to making tiny toque ornaments (here’s the patterns for the first two I made). It’s so much fun knitting up these quick, little hats, instant crafting satisfaction. This week I made one with little red hearts, inspired by Scandinavian Christmas decorations and another with earflaps, inspired by Minnesota hunters. These little hats are about 2″ tall and fit around the top of most wine, beer or liquor bottles. With white cast on 36 stitches. Divide between 3 needles. Join in the round being careful not to twist. Place a marker to mark the end of the row. repeat chart 6 times for each row. Cut the yarn leaving a 6 inch tail. Weave through remaining six stitched on the needle. Pull tight. Pull inside the hat and knot to hold the last stitches tight. Then pull the tail back out the top of the hat. Put just the end of the tail back inside the top of the hat creating a loop on the outside (this is the hanger). Knot to hold the end inside. Weave in all ends. With green cast on 36 stitches. Divide between 3 needles. Join in the round being careful not to twist. Place a marker to mark the end of the row. 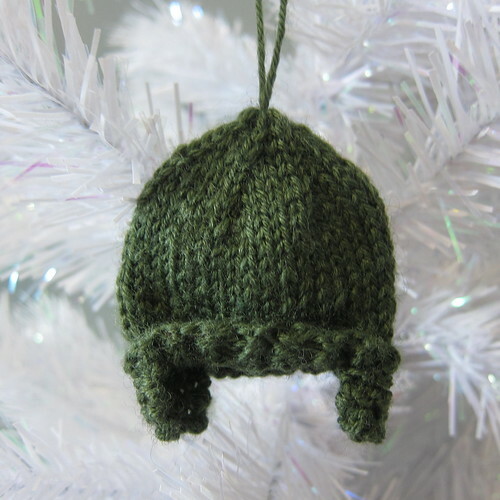 With green yarn pick up 7 stitches on the inside of the hat from the second row of the ribbing. Make a second earflap across from the first. Fold up ribbing in the front. Tack in place if you wish. 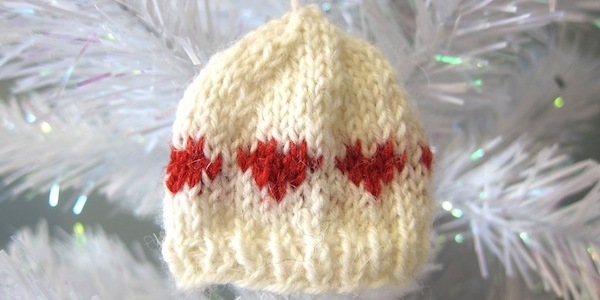 If you make any tiny toques we’d love to see them in our Flickr group! 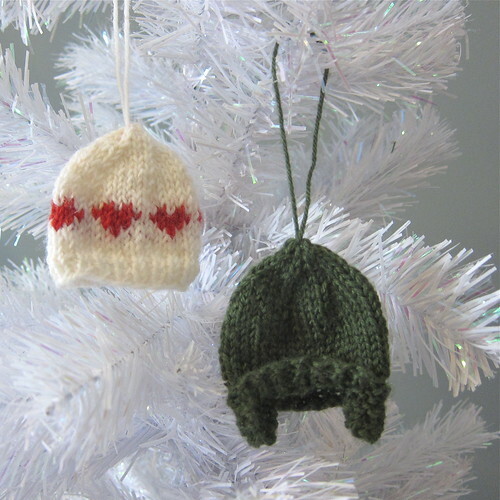 7 years ago by Kat in Christmas , Embroidery , Holiday , Knitting , Knitting Projects , Needlecraft , Projects | You can follow any responses to this entry through the RSS feed. You can leave a response, or trackback from your own site. Nancy – If you copy and paste the pattern to a word file you can make the print any size you want. 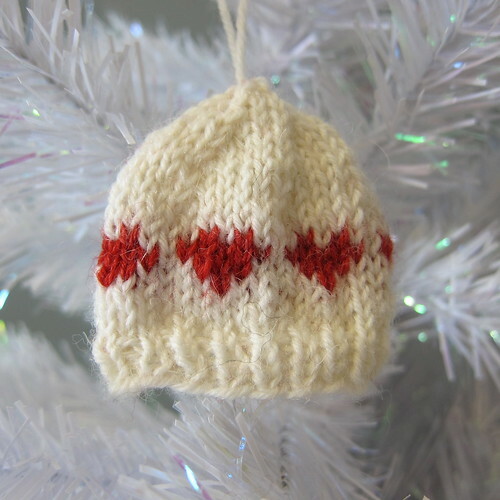 These are perfect to go with the little sweater ornaments I am knitting for Christmas gifts!!! 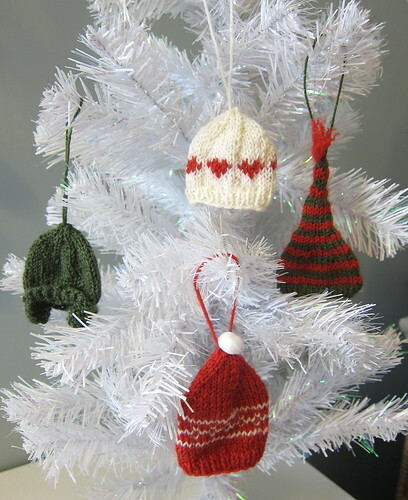 Thank you for these sweet little hats… I think they will be most charming on my table top tree! For the heart hat, rows 8-10 (three rows) say to follow the chart. The problem is the chart is 4 rows long…???? Oops, a little numbering error on my part. It is fixed. Love these little hats, they’re precious! One tiny problem, on row 5 of the earflaps (for the second hat) it says “ssk k5 k2tog”, I’m thinking that should be a k3.